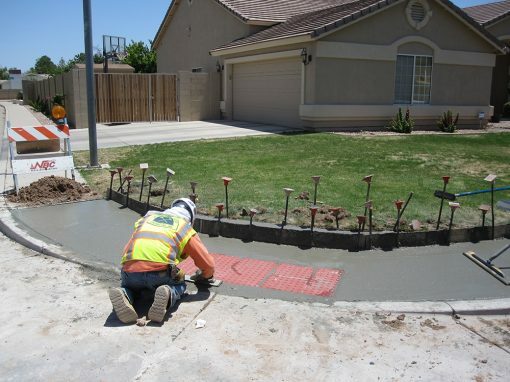 City of Surprise Sidewalk CDBG Project - Valente Contracting, Inc.
MJVC was tasked with creating accessible routes for pedestrians and local businesses through the installation of sidewalk, commercial driveways, ADA sidewalk ramps, and drainage facilities. Scope of work included the removal 3,874 SF of driveway and sidewalk, installation of 22,261 SF of driveway and sidewalk, installation of 20 ADA sidewalk ramps, removal and replacement of asphalt and subgrade. 2017 Valente Contracting, All rights reserved.